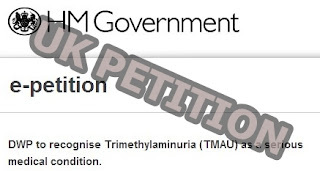 A young British lady has taken the initiative to start a petition regarding Trimethylaminuria (TMAU) on the official government site for UK petitions to the legislators in the UK. Presumably only British nationals are wanted to sign the petition. The petition is to make legislators aware of the effect of having TMAU on those who are TMAU sufferers. If 100,000 signatures could be obtained, the legislators would be likely to discuss the topic in Parliament. All details of signees are kept private. It would be good to get a Doctor to back the UK petition. where do we sign that US petition ?? The US Petition was initiated on June 12, 2011, and we obtained 454 valid signatures by March 2012. Unfortunately, this Petition became invaded by spammers to such an extend, that I was manually deleting over 100 spam signatures a day. As a result, it was closed. I ran across another site called, WE the PEOPLE Whitehouse, https://petitions.whitehouse.gov/ where I see that people create petitions. I think it may or may not be an interesting site for us to start a new petition, but I simply have not had time to look into it. Any volunteer that would like to find out all the details about this opportunity, and to help our community initiate a Petition in this site, if indeed it is safe from spammers, please let me know. I'll welcome your volunteer work that we could coordinate together. The initial MEBO Petition, http://www.meboresearch.org/petition.html was translated into Spanish and Portuguese in the MEBO website, and people from many countries in the world signed it. It's a pity spammers destroyed it. We can start a duplicate of it, so that in the end, we can still take advantage of the initial 454 signatures. Just a thought, if anyone would like to help with this cause.